Sure, basil adds a delightful dash of flavor to your zoodles—but did you know it’s also great for your skin? Not only are plants powerful in terms of your diet (turns out they can even offset your vices) and your environment, but certain herbs and flowers can do things like fight acne and calm inflammation when used on your face. No one knows this better than Joshua Morgan and Brad Scoggins, the duo behind Little Barn Apothecary, who have been crafting organic, holistic products out of all-natural ingredients for years (way before the brand officially launched in 2015). As herb enthusiasts (no, not that kind), they’re well-versed in what to slather and spritz on for everything from calming skin redness to keeping whiteheads gone for good. Clearly, they’re doing something right: Not only is the indie brand an editors’ favorite, but this Friday, August 12, Little Barn Apothecary is opening it’s first brick-and-mortar store in Atlanta. The stylish shop (filled with gorgeous plants, no surprise) is meant to be a hub for natural beauty enthusiasts, who will be able to test the latest and greatest from them—and other under-the-radar brands—as well as learn more about how plants can nourish the skin. 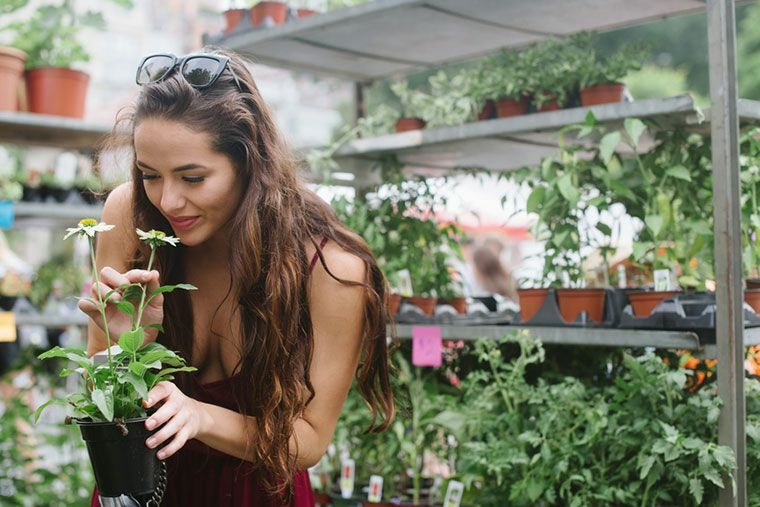 Whether you’re visiting Little Barn Apothecary’s flagship in Atlanta, examining ingredient lists at the drugstore, or shopping the farmers’ market, these are the eight most powerful plants to help you tackle acne and clear up your skin. The green herb is a far better astringent than alcohol (or those harsh acne treatments full of benzoyl peroxide), according to the experts at Little Barn Apothecary. “[Basil] helps to pull things from the skin and acts as an antiseptic,” Scoggins explains. “It’ll help with any inflammation that’s commonly associated with acneic skin and helps to regulate oil production, which is a culprit behind some breakouts.” Don’t have a product featuring basil? Scoggins says that for a DIY cleansing mask, you can simply mash up a few stems and smear them on your face. “The cajeput is similar to tea tree,” says Scoggins. “It’s distilled from the bark of the white wood tree. It’s really good for astringent properties and clearing inflammation. Plus, it’s also antiseptic so it helps to eliminate the bacteria that’s causing breakouts.” And, like basil, this herb is a great ingredient to look for if you have whiteheads. “Chamomile is another herb that’s really great for cleansing the skin,” Scoggins explains. He advises mixing it with natural clays and oatmeal to create a calming facial buff—or look for it in an all-natural cleanser. This beautiful herb is not as delicate as it looks in its natural form. “Blue yarrow is a really powerful astringent that will help to promote skin healing, and it’s one of those very antiseptic herbs which rids skin of bacteria and prevents breakouts,” notes Scoggins. “It’s good for inflammed skin as well as blackheads.” Reach for it when your skin is in full-on freakout mode. Looking for an anti-aging boost to your skin-care regimen? Turn to this floral stunner. “Hibiscus has been called nature’s Botox,” says Morgan. “It’s also great for clearing and helping to firm the skin. It helps with fine lines and diminishing the appearance of wrinkles.” In other words, it’s pretty but powerful. In the middle of an acne flare-up? Here’s how to handle it, the Ayurvedic way. Also worth checking out is this skin-saving (and delicious) smoothie recipe for a beautiful summer glow.